Alexander Ivanov is the author of this elegant woman's portrait. The portrait is painted in the realistic style and bears a resemblance to the paintings, typical for the Russian art of the 18th and 19th centuries. 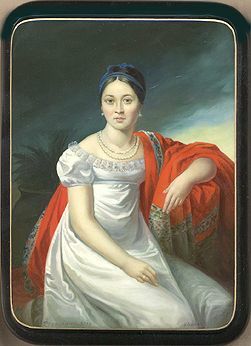 The depicted woman looks at the viewer with dignity; her elegant white, satin dress contrast beautifully with the red shawl thrown over her shoulders. The palette is amazingly close to one that imitates life. By adding a gradation between dark and light blue in the background the artist creates subtle depth of the composition and illuminates the image with tender, even light. The box is constructed from paper-mache. Black lacquer is used to paint the exterior of the piece while red lacquer completes the interior of the box. The portrait is framed with a gold line. Two parallel gold lines decorate the box's sides. The lid is hinged from the left side of the portrait, and the box rests on a flat bottom. The work is signed by the artist's name, the year of 2010 and the village of Fedoskino.